At arrival our staff and helpdesk will greet you for welcome. They will take care of most of for daily business you don’t want to be bothered with during your holidays. And during the night our guards will keep an eye on the premisses and your belongings. The excellent service of our staff, the perfect location at the beach and the ideal sea climate will bring you nice and special and memories to enjoy during and after your stay. 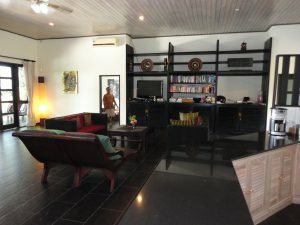 The large living room has a full theatre system including international satellite TV, DVD, CD players and smartphone connection. 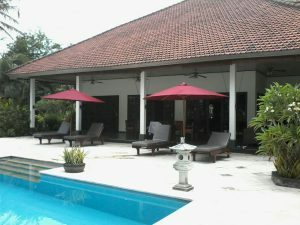 The air-conditioned room is furnished with comfortable contemporary Balinese furniture. The kitchen is fully equipped with every kind of utensil and modern convenience, including a hot & cold water dispenser. A barbeque adds to the gourmet eating provided by Annie and Jim who will cook for you if you buy the food. There is a fully equipped laundry where the staff will wash and iron your clothes. The dining room is part of the open living plan. The Balinese style timber table has eight chairs. Most people prefer to eat outside at the big terras table, but for your convience the staff can prepare for diner inside, and serve after diner outside. 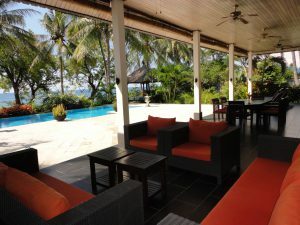 Villa Burung has three bedrooms; two with ocean views and one with garden views. All bedrooms have ensuites, air-conditioning, fans, dressers and spacious timber robes. The rooms are decorated in Balinese style: 1 King size bed, 1 Queen and two twins. Each bedroom has it’s own ensuite Western style fully equiped bathroom, plus there is a guest powder room. All bathrooms are being cleaned by our staff every day. On request our staff can wash towels and clothes. The terrace is paved with natural stone. There is an open dining and lounche area on the verandah, which is cooled by three fans. The view on the garden and sea is magnificent. The tiled horizon style swimming pool is 5×12 m and lit for night-time swimming. The garden covers approximately 3000 sqm. Tropical plants offer their fruits and flowers year round. During the day or at night when the garden is completely lit, you will truly enjoy paradise. The Lotus ponds (3) have fountains, water plants and tropical fish. The ocean side Bale, with mattress and cushions, is the place for daydreaming or for enjoying a romantic tropical sunset. 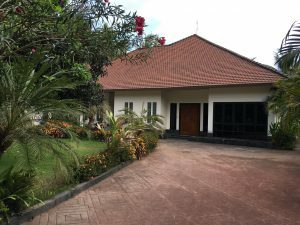 There is a gated entrance directly to the beach, a Hindu home temple and Balinese statues in the garden.